Lots of new faces on this month's chart. 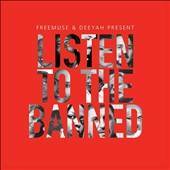 At #1 is a compilation of great music from artists whose music has been banned and repressed in countries as varied as Zimbabwe (Chiwoniso Maraire), Iran (Mahsa Vahdat), and Turkey (Ferhat Tunc). I've been raving about Abraham Inc., and their full album doesn't disappoint. Then there's the unexpected change of flavor on the new album from Garifuna artist Aurelio Martinez, who has brought in guest artists including Youssou N'Dour and Orquestra Baobab, adding a West African root to his new-world music. I suspect I don't need to sing Ojos de Brujo's praises to you. And the final new addition is the collaborative Sufi-favored goodness of Nagore Sessions. More on these new sounds in coming posts, for now check them out and enjoy. And tune in to Spin The Globe on Nov. 19 for samples from each of these CDs and much more.